ESM Nissan team raced to a 1-3 victory at Road America this weekend. The Nissan DPi run by the Tequila Patron ESM team scored its maiden victory on the Road America circuit at Elkhart Lake in Winsconsin. 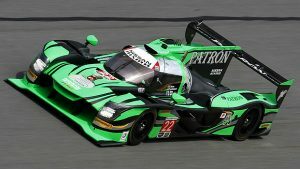 The American team’s success was rounded off by the #2 Nissan DPi’s third place. In addition to being on the first and third steps of the podium in the eighth round of the IMSA WeatherTech SportsCar Championship, Onroak Automotive saw the Visit Florida Racing Ligier JS P217 finish in the top 5 on its first outing. Hewland provides gearbox components to Onroak Automotive for its JS 217 cars of which the Nissan Dpi is a derivative. Hero Motors and Hewland have formed a joint venture to provide a high volume, high quality powertrain solution for OEM’s. The joint venture will utilise Hewland’s advanced transmission design capability and flexible UK manufacturing alongside Hero Motors high quality, cost leading, mass manufacturing capabilities, allowing customers to be supported from initial concept design, right through to high volume supply. The new company will be registered in the UK and known as Hero Hewland Limited, with its head office being located in Maidenhead near London.. Hero Hewland have already seen significant interest from OEM customers. “It was evident that there was a need for this capability and our initial customer contacts are confirming this” said Hewland CEO, Steve Robins. “We look forward to significant growth opportunities supporting new and existing customers for mass volume programs”. Hero Hewland’s customers will benefit from advanced transmission design, prototype and low volume manufacture, test and support by a leading UK transmission company, together with a cost leading high quality mass manufacture option with Hero Motors. This strong partnership will provide powertrain solutions for automotive and commercial vehicle OEM’s, along with an ever growing electric vehicle customer base where Hewland are recognised as a leading designer and manufacturer. Hero Motors, a division of Hero Cycles, is a prominent Tier 1 transmission and component supplier to many European OEM’s. With its head offices based in New Delhi, India, the group employ over 30,000 people and has a turnover in excess of 5.4 billion USD. For more information please visit http://www.heromotors.com. Please subscribe to our newsletter to stay updated about the latest news and views from Hewland.